CSS employs a workforce with a broad range of disciplines. 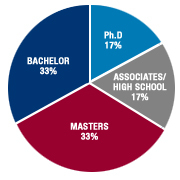 A substantial percentage of our workforce holds advanced academic degrees in the sciences, engineering, or other technical fields. Approximately half of our staff works at government installations or research centers; the remainder work from CSS facilities, or telecommute from home offices.